Aspects are geometric relationships between planets, or where the planets lie in relation to each other. To Magi Astrologers, the aspects are the tools of our trade. The longitudes of the geocentric and heliocentric charts are very similar. The planets' movements are simplified to circles and the aspects in this dimension are when the planets are at specific angles to one another. There are three main types to consider here and they are based on dividing the circle into five, seven and twelve equal parts. The conjunction is common to all of these and is when one planet is very close to another or 0° apart. 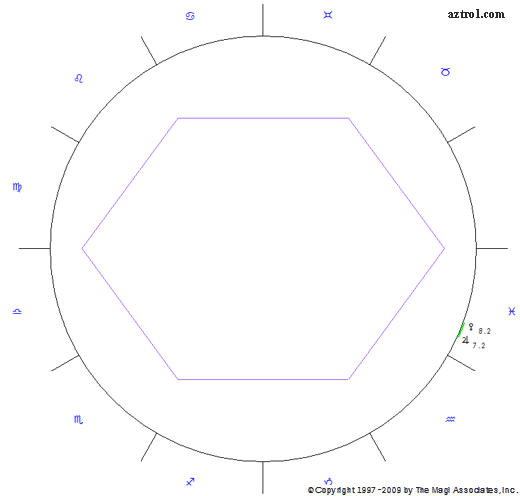 It is included in the discussion of each of the different division types for completeness. We allow a certain margin around the exact degree of an aspect, called an orb, which we'll discuss later. Dividing the circle into five equal parts (Figure 1) gives us segments of 72° and we consider three aspects here (Table 1). Figure 1. 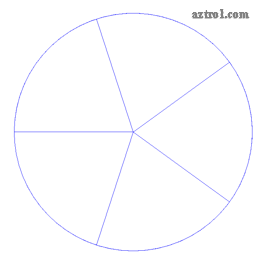 Division of a circle into five equal parts. Dividing the circle into seven equal parts (Figure 2) gives us segments of 51.429° and we consider four aspects here (Table 2). Figure 2. 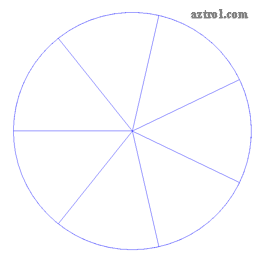 Division of a circle into seven equal parts. Dividing the circle into twelve equal parts (Figure 2) gives us segments of 30° and we consider seven aspects here (Table 3). This is the most familiar and common way of division and gives us the twelve signs of the Zodiac and the houses. Figure 3. 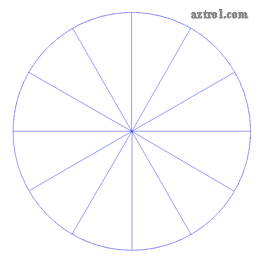 Division of a circle into twelve equal parts. Let's first look at the aspect in the declinations/latitudes before looking at some examples. 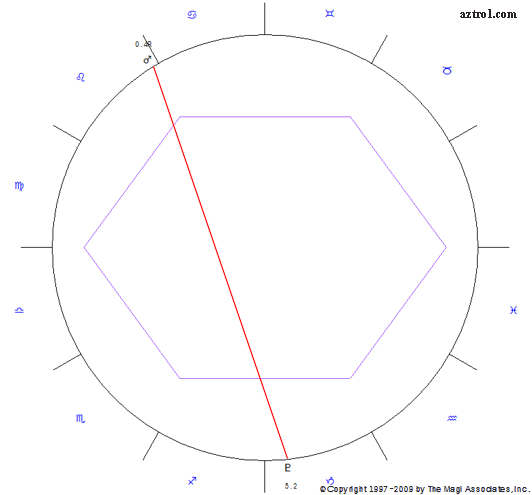 The declinations and latitudes exist in the geocentric and heliocentric perspectives respectively. They are similar in that they are a measurement of the movement of the planets when the Solar System is view from the side. The planets have an up-down movement. Another way of expressing it is that the planets oscillate from a maximum to a minimum. Figure 4 shows this osculation as a sine wave; movement from a maximum northerly position to a minimum southerly one. This movement is most familiar to us as the Sun's apparent position changes during the year creating the seasons. When the Sun is at its most northerly it is summer in the Northern hemisphere and winter in the Southern, and vice versa when the Sun is at its most southerly position. These extreme positions represent the solstices which occur in June and December. 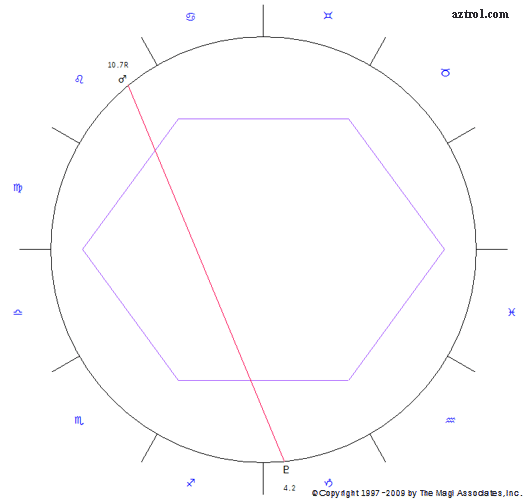 The equinoxes are when the Sun crosses the Equator in March and September. The Sun never moves greater than 23.44° North or South, but some of the other planets do (e.g. Mercury). When two planets are the same declinations (e.g. both 10° North) then we say that they are in parallel to each other. When they are on opposite sides (e.g. 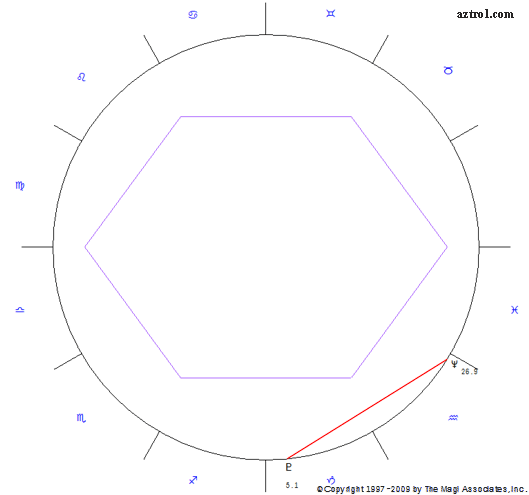 one is 10° North and the other 10° South) then they are contra-parallel. These are the two aspects that occur in the declinations. In the latitudes the same aspects are called parallel and contra-latitude. Figure 4. 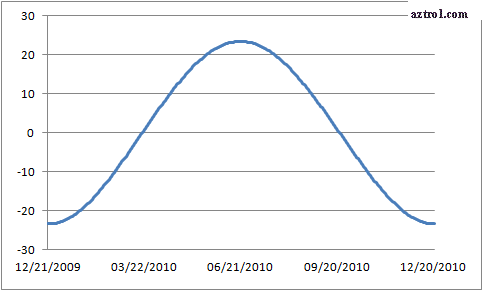 Graph of the declinations of the Sun over one year. 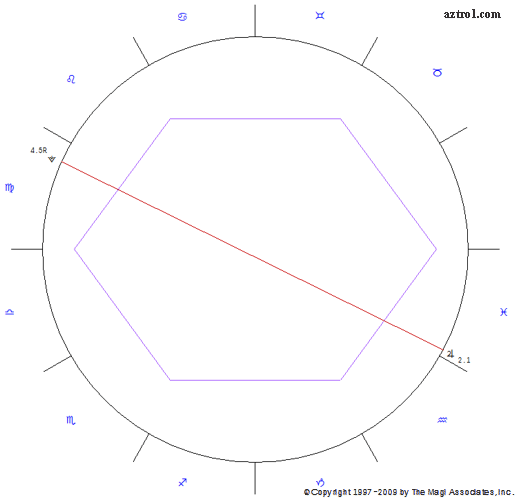 Negative values are when the Sun is South of the Equator, and positive values are when it is North. This means that if two planets are 2.5° apart, we still consider them to be in a conjunction aspect to each other. Tight aspects occur when two planets are very close to being exactly in aspect to one another and these aspects are considered to be very powerful. When we are considering multi-planet symmetrical patterns or synchronisations, we allow a 4° orb of one aspect in the longitudes. There is another kind of orb that Magi Astrologers use; the time orb is the amount of time before or after when an aspect is exact. 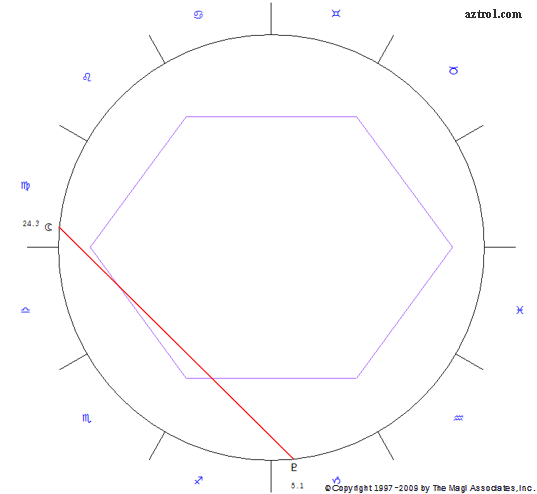 For example, two planets may be in a trine aspect to each other and they will be exactly trine in 19.7 days. Aspects are considered to be very powerful if two planets (specifically slow moving planets) are in aspect and within 3.5 days of the aspect being exact. An aspect may be applying or separating aspects relative to a specific date. 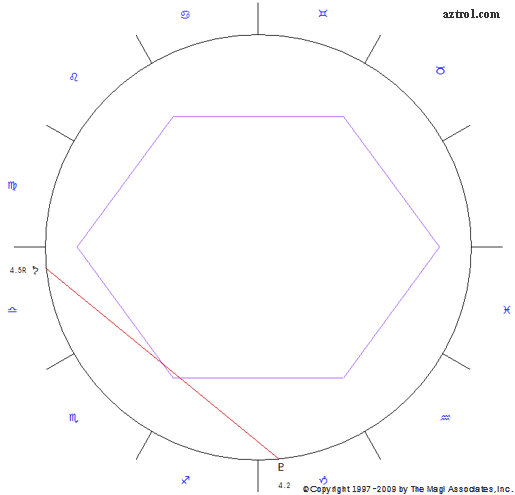 For example, it is 2010 January 31 and a conjunction between Chiron and Neptune in the geocentric perspective is about 16 days from being exact. In other words, the time when the aspect is exact is in the future. We call such aspects applying. On 2010 February 19, this aspect was exact over 2 days ago and we call aspects that have occurred in the past separating. Applying aspects are usually more powerful than separating ones. 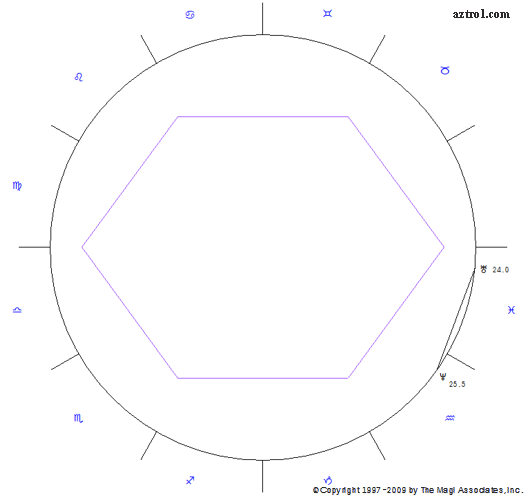 Aspects are indicated on charts by lines. However, it is sometimes difficult to draw a line when two planets are in conjunction because the planets may be very close together. In all other cases lines drawn between the planets show us what aspects exist between any planets. The Magi Society's software indicates the different planets with different coloured lines. Let's look at examples of each type of aspect as seen in this software. Figure 5. Conjunction (0°) between Venus and Jupiter . Figure 6. Quintile (72°) between the Sun and Pluto . Figure 7. Biquintile (144°) between Mars and Pluto . Figure 8. Zodiac7one (51.429°), or septile, between Neptune and Pluto . Figure 9. Zociac7two (102.857°), or bi-septile, between the Moon and Pluto . Figure 10. Zodiac7three (154.286°), or tri-septile, between Mars and Pluto . Figure 11. Semi-sextile (30°) between Uranus and Neptune . Figure 12. Sextile (60°) between Ceres and Chiron . Figure 13. Square (90°) between Saturn and Pluto . Figure 14. Trine (120°) between Venus and Neptune . Figure 15. Quincunx (150°) between Venus and Uranus . Figure 16. Opposition (180°) between Vesta and Jupiter . Figure 17. 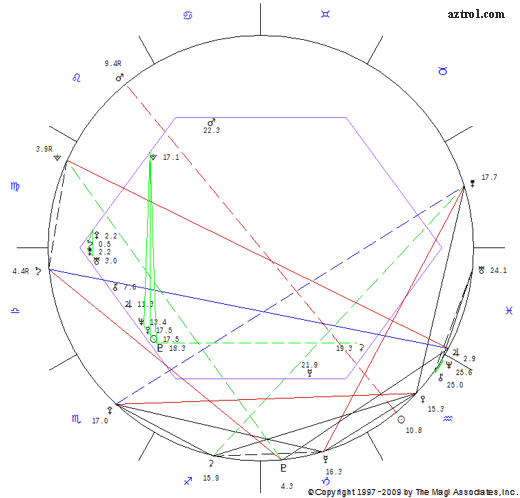 A typical geocentric chart showing the aspects between the planets when the circle of the longitudes is divided by 12.